Chelsea Miller’s right foot is dressed in a strip of white gauze, held together with tape that occasionally slips to reveal the beginnings of stitches. There was an accident, she explains, involving an unfinished knife and some heavy machinery; one slip of the wrist and the metal blade, propelled skyward, came to rest in the leather of her work boot. She was ordered to her bed – a foot needs time to heal – but now, days later, it’s strapped into a sandal as she marches down a dusty stretch of Metropolitan Avenue in Williamsburg, Brooklyn. All, it seems, is well. Chelsea has been making knives for four years, a trade she adopted after helping her father, a blacksmith, recover from illness in 2010. She admits it’s a profession that surprises many who are unable to see past feminine dress and a gentle voice; those who know her, however, are aware there’s more to the story than meets the eye. She loves cars. She collects records. She sings. She’s reading a book about punk rock at the moment, because, she says, she likes rebels. Today, there are 18-wheelers barreling up the road as we make our way from her apartment to her workshop – a tiny plywood cube nestled in the middle of a larger shared workspace – several streets over. The sun blazes. Traffic roars. Still, the conversation continues. And Chelsea, with one foot bandaged, leads the way. Let’s begin by talking about your father, who’s worked as a blacksmith and a carpenter. How has he influenced the way you approach your own craft? I grew up working in the shop with him in Vermont, but blacksmithing and carpentry were never trades that interested me. 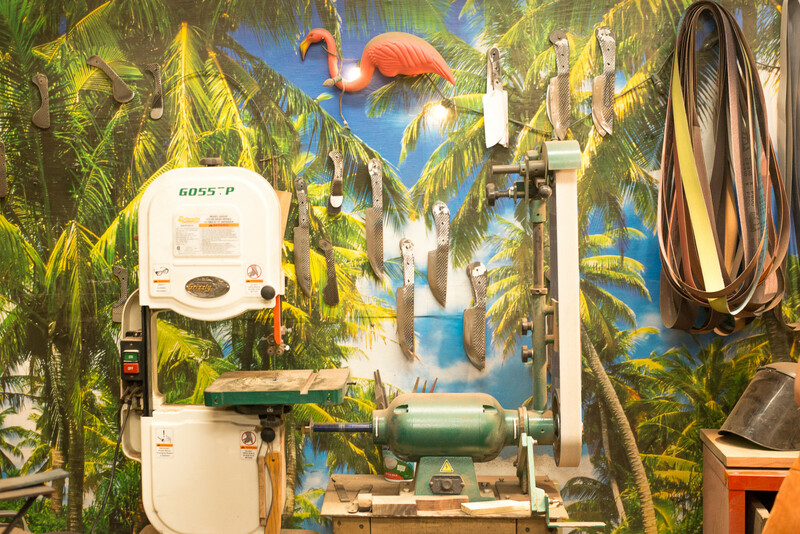 When he became sick in 2010, I needed to go home to help him find new ways to work in his shop – and while I was there, I found knife-making really therapeutic. That’s how I started, and the journey continued from there. In general, we approach things very differently. He started out using very traditional methods in his work, with lots of precise angles. As he got older, and especially after he got sick, it’s become a much more cosmic process for him. He doesn’t have the ability to be precise at this point, so he approaches things from a looser perspective. My work, on the other hand, started from a very cosmic place. I’ve become more skilled in precision as I’ve progressed, but everything originated from a wild imagination. It must be incredibly gratifying to share that sort of connection with someone you love. What do you think he’s taken from the experience? I think it’s been interesting for him to watch me do something that’s really out there with something he’s so familiar with. He always comments on the fact that I like to do everything myself. He has a lot to show me, but I’ll just say, let me do it, let me do it. I always want to make and break and fix everything myself. That’s the way I learn best. When you look back on your childhood, are there any hints of your future career? What did you hope to become? Not at all. I wanted to be an actress for as long as I can remember, which is why I moved to New York when I was 19. I wanted to be a storyteller. And I feel that I am, in a way. Knife-making is another form of storytelling. Take a look at a knife – there’s a story behind that wood. There’s moisture in the grain; there are markings. Each one is so different. And since my knives are made from other tools, there’s a story there, too. They belonged to other trades altogether. And, of course, my own personal story is part of each piece. These things have lives beyond what we can see. How long does it take to make a knife from start to finish? If I were working on a single knife, it would take me around three days. But instead, I work in batches. I usually do six at a time. So I start with the basics and then get them all up to speed together, which takes about a week. It’s a thoughtful process. In the end, I want to produce knives that make you pause. I want you to think about what you’re cooking, and with whom, and how you’ll absorb as many nutrients as possible – in every sense – through the act of preparing food. That’s my goal. Do you have a favorite tool to make? My favorite tool to make is the microplane cheese knife, which spreads, cuts and grates. It doesn’t look like a knife, but it’s so functional. In general, some of my favorite things that I’ve made have happened as a result of accidents. I’ll be designing something, and maybe I’ll take too much off the bottom, which forces me to have to reshape it entirely – and it comes out beautifully. I love that. Knife-making isn’t a trade normally associated with women. How do people react when you tell them what you do, and how well do you know the other females in your industry? I’m very feminine, and that’s been very confusing for some people. It’s also been what excites them most. There are other female knife makers in the community, but I’m pretty removed from it in the end. I’m cautious of being influenced by the work of others, because what I do is so personal to me. It’s part of why I gravitated toward this work, I think – it’s solitary. I really have a need to work on my own. Tell us about your work space. Is it difficult to work in such a small space? I’ve been in my studio for a little over a year. Eventually I’d like to have a space with windows and a bit of natural light, but it’s been great – I can stand in the middle of the room and do everything without having to move very far. It’s all just a reach away. Because there are no windows, I decorated it to look like the beach, with the wallpaper and the flamingo and the lights. There are photos of my dad, family artwork, pieces of wood from Vermont. It may be tiny, but everything has its place. And what about your home? It looks and feels a bit like a cabin in the middle of the city. It’s funny: my room at my parents’ house in the country is very minimal and modern. Something about being in those rustic surroundings inspired that. And the opposite happened here in the city, where things are very industrial. Something that I realized when I started to decorate my home is that my taste is very masculine. I have pieces of farm tools laying around from Vermont – they don’t serve a purpose, but they’re a reminder of where I came from. Everything has a story: the branch above my bed I yanked from the ground in McCarren Park. The pottery on my dresser are pieces my sister made. The hyena sculpture in the living room I found in a junk store, in a pile of rust – the same way I find many of the materials for my knives. I love sorting through collections like that, picking out the gems. Speaking of collections, it’s hard not to notice your records. Has music been a major creative influence for you? I never would have survived beyond the age of 16 without music. It’s always helped me express myself, through singing and by listening to other people’s work. But really, I take inspiration from everywhere, whether it’s meeting interesting people in different places around the city, or reflecting on emotional hardships I’ve experienced in my life. The idea of living as full a life as possible has driven me the most. Do you have a creative hero? My first thought is Calder. There’s something about his pieces, that balance large and small. They’re so graceful. ‘Grace’ is a big word for me. As a person – as a piece of human art – you have so many decisions you’ll make over the course of your life. How you manage your emotions and your reactions to the things that come your way is huge. Approaching everything as gracefully as possible is the biggest challenge I can think of – but it’s also one of the most inspiring. To finish, your kitchen tool expertise begs the question: do you cook? I love to cook. I love to host Friday night dinners. It’s such a nice thing, knowing where you’re going to be on a Friday evening, and that all of your friends know they’re welcome. I look forward to it all week. I like to approach cooking by thinking of the whole experience – I love to spend all day on a meal, letting things marinate. It’s soul food. I’m all about that – and lots of wine, too, of course. To learn more about the artist – and to purchase knives and other kitchen tools – visit Chelsea Miller Knives. Meet more creatives in New York through our previous interviews.